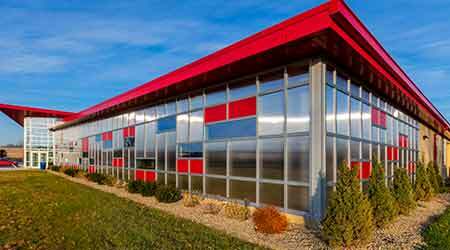 LIGHTWALL 3000 curtain wall from Exterior Technologies, Inc. accepts both insulated glass units (IGUs) and cellular polycarbonate glazing (CPG) panels in the same extruded aluminum, thermally broken, framing system. This is accomplished by using deep glazing pockets, low-friction gaskets and controlled gasket pressure that allow for the thermal movement of polycarbonate. Supporting energy-efficient performance, the LIGHTWALL 3000 system’s 3-inch-wide extruded aluminum framing is thermally broken to help maintain comfortable interior temperatures for occupants, and to contribute to reduced HVAC loads for building owners. The system meets additional demanding performance specifications for structural strength, and internal water control. Directing water to weep holes, end dams are placed on each horizontal mullion. Optional, shallow vertical mullions enable the curtain wall to integrate with an existing structure. Large vertical spans can be achieved with deep, vertical mullion options. Aluminum caps also may be requested to cover pressure caps and provide a finished architectural appearance. The framing system uses 38.95 percent recycled aluminum as standard and may be specified in a broad choice of finish types and colors. After its useful life as part of a curtain wall, the metal is 100 percent recyclable.